Speakman Optimus SE-1200 Combination Shower and Eye and Face Wash Station combines the Optimus with an emergency shower system. The Optimus Eye and Face Wash is equipped with a highly visible ABS plastic bowl and delivers full-coverage relief in the event of an emergency situation with a dual aerated eyewash and two individual face pads. An extended pull rod can be added and the pipe fittings can be easily switched to comply with ADA height specifications. Installing this station is effortless due to the top or side inlets which easily install into existing plumbing connections. 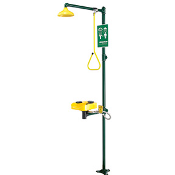 This combination shower and eye and face wash station is 100% ANSI Z358.1 Certified and OSHA compliant.